If I asked you which team in all of Major League Baseball had a bullpen door accidentally left open along their outfield wall, and then had a sharply hit ball by the opposition find exactly the absolute center of that three feet of space, as if guided by the movement of the very cosmos, and go through the open door for a ground rule double, you’re going Mets every time, right? That’s Aaron Hicks of the Yankees ripping a slicing liner to the gap in right center, and the ball just hunting that gap in the wall like a guided missile. Of all the trajectories available, and of all the times when that exact hit could find that exact spot in the wall, forces beyond human comprehension conspired to match that precise trajectory with that precise moment when the door was left hanging open. It’s enough to make a man believe there are dark forces at work. 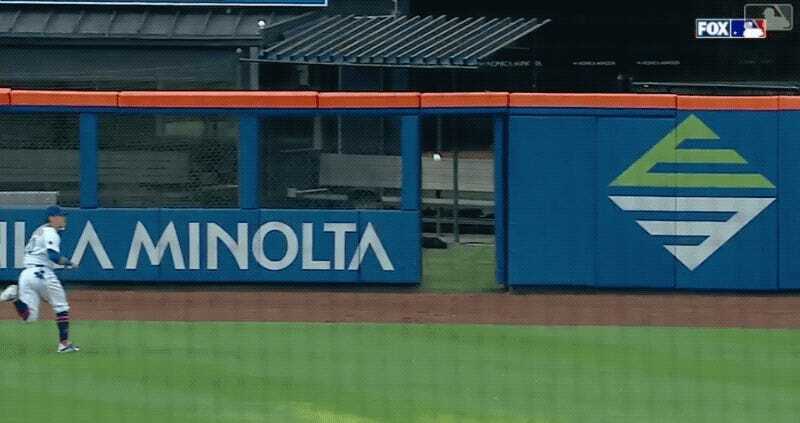 The Mets came into the game at 27-33, on a seven-game losing streak, and with the ignominious distinction of having appeared on the transaction wire since Opening Day an MLB-high 118 times. The Yankees, on the other hand, have the best record in baseball. They beat the Mets Saturday on an Aaron Judge eighth-inning dinger, extending that Mets losing streak to an MLB-worst eight games. Meanwhile, the two Mets aces—Jacob deGrom and Noah Syndergaard—were being seriously discussed as possible Yankees trade targets. Fate apparently isn’t finished hurling daily humiliations at the Mets.